On his first trip as U.S defense secretary to parts of the Middle East and Africa, Jim Mattis will focus on the fight against Islamic State and articulating President Donald Trump's policy toward Syria, officials and experts say. His trip may give clarity to adversaries and allies alike about the Trump administration's tactics in the fight against Islamic State militants and its willingness to use military power more liberally than former President Barack Obama did. One of the main questions from allies about Syria is whether Washington has formulated a strategy to prevent areas seized from militants from collapsing into ethnic and sectarian feuds or succumbing to a new generation of extremism, as parts of Iraq and Afghanistan have done since the U.S. invaded them. U.S.-backed forces are fighting to retake the Islamic State strongholds of Mosul in Iraq and Raqqa in Syria, and questions remain about what will happen after that and what role other allies such as Saudi Arabia, can play. There are signs that Trump has given the U.S. military more latitude to use force, including ordering a cruise missile strike against a Syrian air base and cheering the unprecedented use of a monster bomb against an Islamic State target in Afghanistan last week.Administration officials said the U.S. strategy in Syria -- to defeat Islamic State while still calling for the removal of Syrian President Bashar al-Assad -- is unchanged, a message Mattis is expected to reinforce. Arriving in the region on Tuesday, his stops include Saudi Arabia, Egypt, Qatar and Israel. "Particularly with the Saudis and the Israelis, part of the discussion will be clarifying for them what our strategy is towards Syria in light of the strike," said Christine Wormuth, a former number three at the Pentagon. Islamic State has lost most of the territory it has held in Iraq since 2014, controlling about 6.8 percent of the nation. The United States also is considering deepening its role in Yemen's conflict by more directly aiding its Gulf allies that are battling Houthi rebels who have some Iranian support, officials say, potentially relaxing a U.S. policy that limited American support. "The Saudi concern is strategically Iran... The near-term Saudi concern is how they send a message to the Iranians in Yemen, and they would like full-throated American support," said Jon Alterman, head of the Middle East program at the Center for Strategic and International Studies think tank in Washington. The review of possible new U.S. assistance, which includes intelligence support, would come amid evidence that Iran is sending advanced weapons and military advisers to the Houthis. Congressional sources say the Trump administration is on the verge of notifying Congress of the proposed sale of precision-guided munitions to Saudi Arabia. Some U.S. lawmakers have expressed concern about civilian casualties in Riyadh's campaign in Yemen. 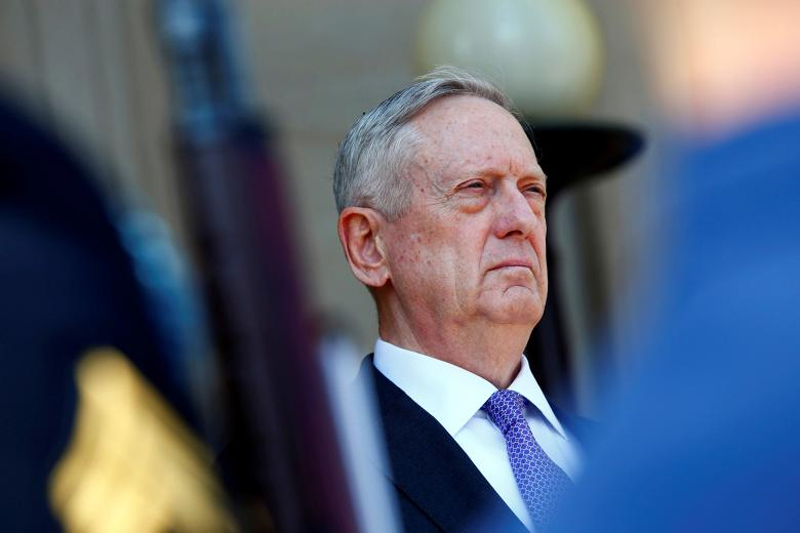 Experts say Egyptian officials are likely to seek more support from Mattis, a retired Marine general, for fighting militants in the country's Sinai peninsula. Islamic State has waged a low-level war against soldiers and police in the Sinai for years, but increasingly is targeting Christians and broadening its reach to Egypt's heart. "They would also like more American support in fighting terrorism in the Sinai peninsula and they like more American confidence that they are doing it the right way," said Alterman. Mattis also will be visiting a U.S. military base in Djibouti, at the southern entrance to the Red Sea, where operations in Yemen and Somalia are staged, and just miles from a new Chinese installation. The White House recently granted the U.S. military broader authority to carry out strikes against al Qaeda-linked al Shabaab militants in Somalia. Last week the Pentagon announced that a few dozen U.S. troops had been deployed to Somalia to train members of the Somali National Army.